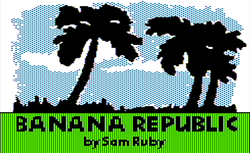 Banana Republic, also sometimes identified as Redemption II, is an Eamon adventure written by Sam Ruby and published by Softdisk. It is a sequel to Ruby's earlier Redemption. This page was last edited on 3 April 2019, at 09:31.